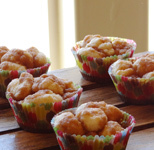 Simply delicious baby shower desserts and recipes to make your job as a hostess easy and fun! A lot of these food ideas can be made ahead of time to save you from stressing out during the last minute time crunch. 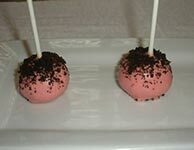 We also have a recipe for chocolate covered strawberries in our centerpiece section. 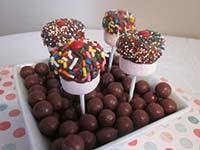 Another idea to use for your baby shower dessert is a chocolate fountain. 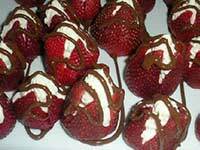 Since women love chocolate, it is always a huge hit at baby showers. 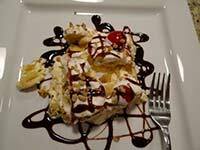 Provide your guests with a variety of yummy things to dip in the chocolate...like angel food cake, pretzels, marshmallows, and fruit to keep them happily busy in chocolate bliss!! Team it up with our winning recipes and food ideas for appetizers, side dishes, cookies, and main dishes for a fabulous baby shower meal! In a large saucepan, melt butter. Add Karo syrup and brown sugar. Bring to a boil for 6 minutes. Remove from heat. Add sweetened condensed milk. Pour over popped popcorn. There will be more sauce than needed to cover the popcorn. Tip: Put leftover sauce in Tupperware and place in refrigerator. To enjoy again, just heat in microwave and pour over popcorn! Preheat your oven to 250 degrees. While you are popping popcorn, get out a large pan and melt the butter at a medium high heat. Add the brown sugar and corn syrup as soon as the butter is melted and bring to a boil. Boil for 5 minutes and remove from heat. Add the salt and vanilla extract and stir to incorporate. Pour mixture over your popcorn and stir to coat evenly. You can add more popcorn if there is too much liquid. 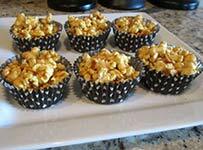 Spread caramel popcorn on 2 greased cookie sheets and place in the oven for 30 minutes. Stir the popcorn and continue to bake another 30 minutes. Remove from oven and let cool. Break into pieces and enjoy! Combine pudding mix and milk in a bowl and mix well until all lumps are gone and mixture is thick. Add cool whip and mix well. Open package of graham crackers and break crackers in half. Lay graham crackers side by side in a 9x13 plan. 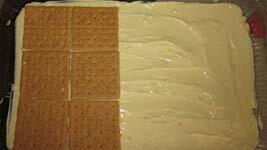 Layer half of pudding mix on top of graham crackers. Add another layer of graham crackers, followed by the final layer of the pudding mix. Place down last layer of graham crackers. Warm frosting in microwave for 15 seconds. 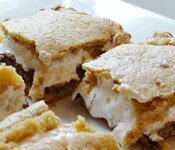 Spread frosting on top of graham crackers. Refrigerate for at least 4-24 hours before serving. Enjoy! Soften ice cream and sherbet. Stir together until well mixed. Stir in lemonade concentrate. Stir in raspberries (including raspberry juice). Cut bananas into chunks and stir in. Freeze before serving. So yummy! Pre-heat oven to 325 degrees. Line a cupcake pan with cupcake wrappers. Mix graham crackers, 1/4 cup of sugar and butter in a bowl. Spoon 2 tablespoons of mix into each cupcake liner and press flat. Cook in oven for 3 minutes. Remove from oven and cool completely. Once crusts have completely cooled mix cream cheeses and 3/4 cup of sugar in a mixer until fluffy (around 5 minutes). Add eggs, one at a time and mix to incorporate. Add lemon juice and mix again. Cracking can be caused by a few things. Two of those include an oven that is too hot or over mixing the cream cheese. 325 was a perfect temperature for me and 350 was too hot. Don't prepare your filling until the crust is completely cool. That way the cream cheese mixture is mixed only once and not over mixed when you are ready to use it. . 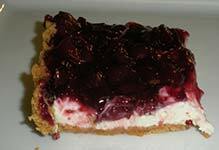 Strawberry Cheesecake: Replace graham cracker crumbs with Oreo cookie crumbs. Spoon cheesecake mixture on top. Roughly chop 1 cup strawberries. Blend in blender with 2 tablespoons of sugar. Press mixture through sieve to remove seeds. 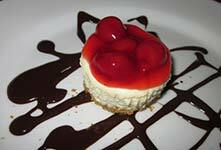 Sprinkle a few drops on top of cheesecake mixture and swirl with a toothpick. Bake. Oreo Cookie Cheesecake: Place an Oreo cookie in the bottom. Spoon cheesecake mixture over it. Place 5-6 chocolate chips on top. Bake. Put butter and water in a saucepan and heat to boiling. Add flour and mix to a stiff ball. Add eggs, one at a time and mix well. 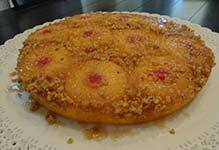 Spread on large cookie sheet or jellyroll pan sprayed with nonstick spray. Bake 20 minutes at 400 degrees. Cool. Prepare pudding as for pie. Soften cream cheese; add to pudding and spread on cooled cake. Refrigerate. 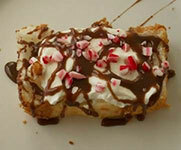 Before serving; cover with cool whip and drizzle with Hershey's chocolate syrup. Hint: The mixture will have a mounds look to it when finished baking. This is normal! Mix cream cheese, 1 tablespoon of milk and sugar in a large bowl. Gently stir in half of whipped topping. Spread on graham crust. Pour 1 cup milk in into a large bowl. Add pumpkin, vanilla pudding packages and spices. Beat with wire whisk until well blended. Spread over the cream cheese layer. Refrigerate 4 hours or until set. Top with remaining whipped topping before serving. Heat up a small amount candy melts in the microwave, in 30 second intervals, stirring until candy is smooth and melted. Dip end of lollipop in the candy melts and push into the marshmallow. 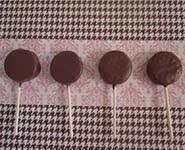 While allowing the sticks to dry, melt candy melts for your outside coating. Prep any toppings you will need. Dip marshmallows in candy melts and top with your choice of toppings. Hint: If covering the whole marshmallow, place marshmallow pops in the freezer for 10-15 minutes before you dip them so they do not swell up from the heat. If you are only dipping half of the marshmallow, you will not need this step. Put margarine in a 9X13 inch pan and melt in oven heated to 325 degrees. Combine flour, 2 cups of sugar, baking powder and milk. Pour over melted butter. If using fresh peaches, sprinkle a cup of sugar over the peaches. 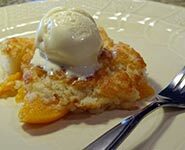 When canned peaches are used, omit 1 cup of sugar from the recipe. Spoon peaches over top of batter. Bake for 1 hour. 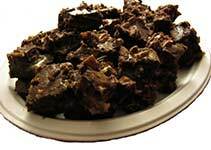 In a microwave safe bowl melt the chocolate squares. Mix in the can of sweetened condensed milk. Set out sliced angel food cake, chocolate glaze from above, the whipped topping and the bowl of crushed candy for your guests to enjoy. Very light but rich at the same time. Oh so good! Stir together flour, baking powder, and salt. Beat together 1/2 cup of sugar, egg and butter until smooth. Blend in flour mixture. Pear slices in a greased 8 inch square baking pan. Sprinkle with lemon juice. Stir together 1/3 cups sugar, 2 tablespoons flour, cinnamon and ginger. Sprinkle over pears and toss. Drop batter by spoonfuls over pears. Bake at 375 degrees for 35 to 40 minutes or until topping is crisp and brown. Serve hot or cold with whipped cream. Makes 6-8 servings. Cream together cream cheese, butter and powdered sugar. In a separate bowl, mix the vanilla pudding packages and milk until thick. Add cool whip and mix again. Add the two mixtures together. Set aside. Crush Oreo cookies. Use a flower pot or individual clear cups to display. 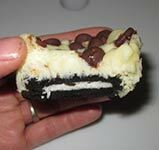 Layer Oreo cookies and filling mixture in your dish. You can hide gummy worms in between the layers. Put a few gummy worms on top. The Oreo cookies will resemble a dirt mixture. Fake out your guests! It is fun to set this dessert in the middle of the table as a centerpiece. Use a flower pot. You can turn the cool whip lid upside down inside the flower pot so the mixture will not run out the bottom. Place some fresh flowers into the mixture. I like to use plastic wrap around the bottom of the flower so the dirt cake does not get dirty. Announce that for dessert everyone will be eating the flower! Use a clean garden trowel to scoop out the mixture. Mix pumpkin, eggs, milk, spices, and sugar. Pour into 13x9 cake pan. Mix cake mix with margarine and nuts. Put on top of pumpkin mixture. Bake at 350 for 1 hour. Mix together above ingredients and spread in 9X13 cake pan. Press to the bottom. Bake at 325 degrees for 10 minutes. Cool Completely. Add sugar to softened cream cheese. Mix well. Fold this into cool whip. Add vanilla and lemon juice. Pour over cold crumb crust. Over this spread the blueberry pie mix. Cover the top with crushed vanilla wafer crumbs-optional. Refrigerate well before serving. Whip topping and powdered sugar together until it becomes thick. Set aside in refrigerator to chill. Preheat oven to 425 degrees F. In a large pan bring water and butter to a rolling boil. Remove pan from heat and stir in flour until mixture forms a ball. When shells are cool, cut a slit into the side and fill with cream mixture or use a pastry bag and pipe the filling into the shell. Dust with Powdered sugar. 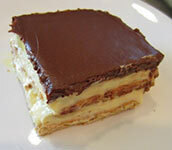 Chocolate Eclairs: Use this same recipe, but form puffs into long oval shapes. Top with chocolate frosting. Optional filling: 1 pkg. Vanilla Pudding, 1 cup milk, 2 cups Cool Whip. Mix pudding with mix until thickens. Fold in Cool Whip. Blueberries, strawberries, raspberries, pineapple, mandarin oranges, kiwi, peaches- if any of your fruit is canned, make sure it is well drained and patted dry with a paper towel before using. Preheat oven to 350 degrees. Grease a 12 inch round pizza pan. Cut cookie dough in slices, about 1/2 inch thick. Place on pan and press seams together until you have an even crust. Bake in oven for 17-20 minutes. Remove from oven and allow to cool completely. In a mixer, cream the cheese with sugar and vanilla until smooth and fluffy. Rinse fruit and slice any fruit as needed for your design. Spread cream cheese mixture on cooled cookie crust. 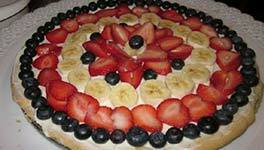 Arrange fruit on cream cheese mixture, making sure to not get too close to the edge. Heat apple jelly until liquefied. Spoon over fruit. Serve within 2 hours. 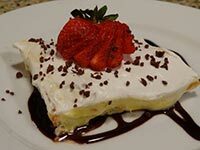 Tips: This is a great desert but any moisture can cause the crust to get soggy. Prep the pieces beforehand and put together no more than 2 hours before serving to get the best results. Dry off any canned fruit well before using and keep fruit on the cream cheese mixture and not the cookie so it does not turn soggy from the fruit. Enjoy! Preheat oven to 350 degrees. For tart shells, beat butter and cream cheese until well blended. Add flour; mix until soft dough forms. Shape dough into 1-inch balls. 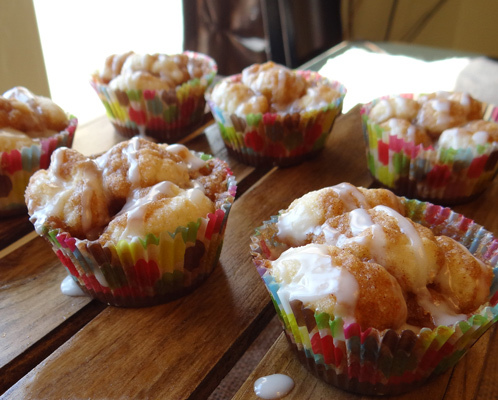 Place balls of dough into mini muffin tins. Press dough into the sides of each muffin tin to form tartlet shells. Prep your dish for an easy no fuss dessert! 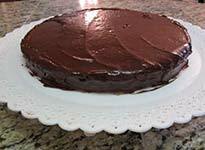 Cook and cool your favorite chocolate cake recipe. I used my favorite death by chocolate cake. Wash raspberries and dry excess moisture with paper towels. Prepare chocolate pudding according to recipe. Cut the chocolate cake in chunks. To make the raspberry trifle, start by layering chocolate cake in a trifle dish. Next layer 1/2 the chocolate pudding mixture on top of the cake. Spoon a layer of raspberry jelly on the pudding mixture. Next, cover jelly with a layer of fresh raspberries. Spoon half of the whipped topping on top. Continue layering the cake, pudding, jelly, raspberries and whipped topping until you reach the top of the dish. Sprinkle some fresh raspberries on top. Tips: Make this dish single serve by using glass or see through cups for each of your guests to enjoy! Mix flour, sugar and butter with a pastry blender. Stir in nuts. Press dough into a 13 x 9 pan. Bake 350 degrees for 20 to 25 minutes. Cool. Beat ingredients until very light and fluffy. Approx. 10 minutes. Spread mixture over cooled crust. Spread pineapple over filling. Lay bananas over pineapple. Spread Whipped topping over fruit. Sprinkle nuts over whipped topping. Evenly space cherries over top. Drizzle chocolate syrup over top. Refrigerate until serving. Preheat oven to 350 degrees. Melt butter in a 12-inch oven proof skillet over low heat. Remove from heat and stir in brown sugar until well blended. Sprinkle nuts evenly over brown sugar. Drain pineapple, reserving juice; set aside. Arrange pineapple slices over brown sugar and nuts in skillet. Place a cherry half in center of each pineapple slice. Add enough water to pineapple juice to measure 1-1/3 cups liquid. In a bowl, combine cake mix, pineapple juice, eggs and oil. Whisk until well blended and smooth. Pour over fruit mixture in skillet. Bake 35 to 40 minutes or until cake tester inserted in center comes out clean. Remove from oven; cool 5 minutes. Carefully loosen edges of cake. Invert onto large serving plate. Cool slightly; garnish with whipped topping. 12 servings. I am usually not a huge fan of cake box mixes. But this recipe is A-M-A-Z-I-N-G! 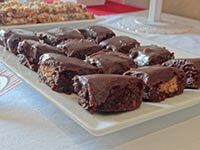 You can take a simple cake mix and make it into a fabulous and decadent baby shower dessert with just a few adjustments. Preheat oven to 350 degrees. Mix together cake mix, sour cream, pudding mix, eggs, oil and water. Stir in mini chocolate chips. Pour into a well-greased cake pan of choice. This works great in Bundt pan or in 2- 9 inch round pans or a Bundt pan. The one in the picture was made with a 12 inch round pan. Cook about 45-50 minutes or until toothpick comes out clean. Butter inside of spring form pan. 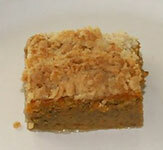 1/2 cup Graham Cracker crumbs- Sprinkle bottom and sides of pan. Mix. Put entire pan in larger pan of Boiled water 1/2 inch deep. Bake 1-1/2 hours. Turn off oven and Let sit 20 minutes. Let cake reach room temperature. Refrigerate. Preheat oven at 350 degrees. Line a 9x13 pan with parchment paper. Grease bottom and sides of paper. Set aside. Place butter, chopped chocolate and chocolate chips in a metal bowl. Set bowl over a pan of simmering water. Stir until mixture is smooth and melted. Remove from heat. Mix in sugar, eggs and vanilla extract and whisk together. Add flour and salt and mix until barely incorporated. Pour half of the mixture into the 9x13 pan and spread evenly. Place in oven. Cook for approximately 25 minutes. You want it cooked most of the way. 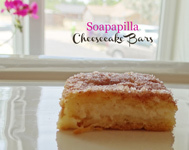 It is ok if you get a little on the toothpick but you don't want it completely gooey. Cool for 20 minutes. 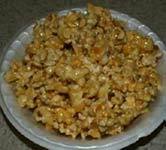 To make the caramel center, you can either use my caramel popcorn recipe from above or make it from caramels. To make it from caramels, combine the caramels and heavy cream in a pan set at medium heat. Stir constantly until it is melted and smooth. 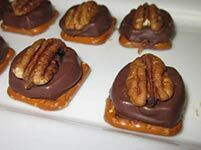 Mix caramels with half the pecans. (I like to slightly toast the pecans by placing them in a pan set at medium heat, stirring occasionally until I can smell the roasted smell. It really adds to the flavor.) Spread the caramel layer evenly on top of the cooled brownie. Then spread the remaining brownie batter on top of the caramel. Sprinkle the remaining pecans on top. Place back in the oven and cook for another 25-30 minutes, depending on your oven. Prepare brownie mix as directed on package. Pour into greased 13 x 9 inch baking pan. Beat cream cheese with mixer until smooth. Add sugar; mix well. Add egg and vanilla; mix just until blended. 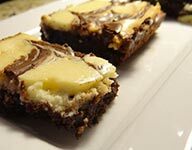 Pour cream cheese mixture over brownie mixture; cut through batter with knife several times for marble effect. Remove from heat and add 1 cup of water. Mix well. Combine cocoa/margarine mixture and the flour/sugar mixture and stir until smooth. Stir until smooth. Pour batter onto greased and floured cookie sheet with 1 inch sides. Bake at 350 degrees for 15-20 minutes. Preheat oven to 350 degrees. Grease an 8x8 pan. 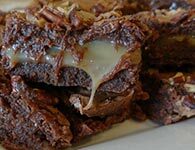 Combine brownie mix with water, vegetable oil and egg and mix well. Pour half the batter into your pan. Lay your eight cookies on top of the batter in the pan, equally spaced out. Pour the remaining batter on top of the cookies and smooth out. Place remaining cookie on top of your batter. Bake for approximately 40 minutes. 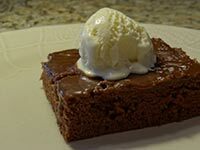 Allow brownies to fully cool. Place chocolate chips in a heat proof bowl and set to the side. Combine whipping cream, peanut butter and salt in a pan. Start with the heat on low and mix until mixture is fully combined. Raise heat to medium and stir constantly until bubbles form on the outside edges of mixture. Remove from heat. Pour cream mixture over chocolate chips and let sit for about 5 minutes. Stir until barely combined. Do not over stir. Let ganache cool. 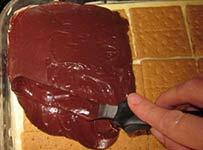 Spread ganache on top of the brownies once it is thick enough to spread. Put in refrigerator to fully set up. Enjoy! Preheat oven to 350 degrees. Place cupcake liners in cupcake pans. In your stand mixer bowl, add flour, salt, 6 tablespoons of sugar and baking powder. Mix on lowest setting to barely incorporate. Pour buttermilk, milk, and butter into flour mixture. Mix on a low setting until mixture is barely incorporated. Do not over mix! Pour 1 cup of sugar in a container with a lid. Scoop dough 1 teaspoon at a time and place in the container in shakeable increments (depending on the size of your container, somewhere between 14-18 balls is a good average). Place 7 dough balls in each cupcake liner. For the topping: Melt 2/3 butter. Mix with 1 1/2 cups of brown sugar and cinnamon. Spoon 1 spoonful of topping under the top dough ball of each cupcake. Evenly spoon remaining mixture over the top of each cupcake. Bake each pan for approximately 19 minutes. Allow to cool in cupcake pans. Store in covered containers. 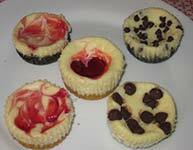 For a nice touch, drizzle a glaze over the top of the cupcakes. In a small container, mix powdered sugar and milk. Scoop mixture into a sandwich bag and snip the end. Drizzle glaze over the cupcakes. Enjoy! These cupcakes are so yummy! But I like them a little more warm. Set your oven at 200 degrees and warm up the cupcakes before serving. Preheat oven to 350 degrees. Lightly grease a 9x13 pan. Line the inside of the pan with parchment paper and set aside. Cream butter and sugars in a mixing bowl until light and fluffy. Add eggs and vanilla and mix again. In a separate bowl, mix together graham cracker crumbs, flour, salt and baking powder. Add flour mixture to butter mixture and mix until barely incorporated. Cover bowl and chill in the refrigerator for 15 minutes or so. Split dough in half. Press half of the dough into the bottom of the pan in an even layer and return the rest of the dough to chill in the refrigerator. 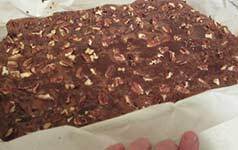 Unwrap chocolate candy bars and evenly lay them on top of the cookie dough, side by side until cookie dough is completely covered. Open both containers of marshmallow fluff and spread on top of the chocolate with a butter knife in an even layer. Remove remaining dough from the refrigerator. Place on a sheet of parchment paper and roll out to the approximate size and shape of the pan. Using a knife, cut the dough in sections and softly place on top of the marshmallow layer until completely covered. Use fingers to seal edges of the crust. Bake in the oven for 20-22 minutes. Allow to cool a little before cutting. Enjoy! I tried hard to make them look pretty on a serving plate, but they were too ooey gooey to cooperate. Lol! I think next time I will just cut them and let the guests pull their piece apart. Soo good! Preheat oven to 350 degrees. Unroll 1 1/2 cans of crescent rolls and lay flat on the bottom of 1 cookie sheet. Stretch rolls to completely cover the pan. Press any seams shut to seal. Bake in oven 5 minutes to crisp bottom layer. Remove and cool. 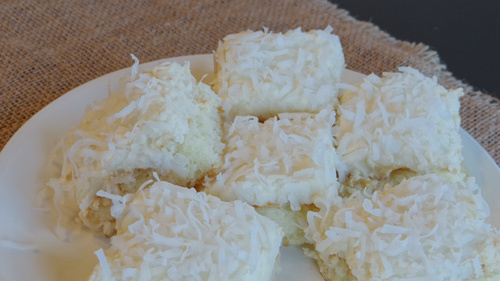 In a medium bowl, beat cream cheese, vanilla an sugar until light and fluffy. Spread cream cheese layer evenly on crescent roll crust. 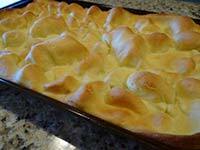 Unroll remaining crescent rolls and lay on top of the cream cheese layer, pinching any seams closed. Pour your melted butter evenly on top of the crescent rolls. Mix remaining sugar and cinnamon. Sprinkle evenly on top. Bake in oven for approximately 30 minutes. Allow to cool before cutting into squares. 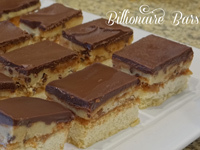 These decadent dessert bars are layered with shortbread, caramel, cookie dough and ganache. There are a lot of steps, but it can be made a day or two ahead of time and stored in the refrigerator until you are ready to cut and serve. So yummy! Line a 9x13 pan with parchment paper and preheat oven to 350 degrees. 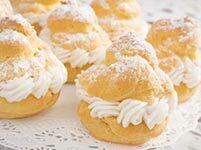 In a stand mixer, cream butter and sugar until light and fluffy. (2-3 minutes) Add flour and salt and mix just until combined. Bake for 30-35 minutes until edges are lightly browned. Cool Completely. In a tall sided pan, combine sugar and water over medium high heat. The most important part of successfully making this caramel is to not touch the pan. Stirring or disturbing the sugar will cause it to crystallize. Carefully watch it come to a boil. Watch until the color starts to change to an light amber. If needed, you can swirl the mixture to even the cooking, but do not stir. As soon as the color changes to a light amber, remove from heat and stir in butter, being careful not to burn yourself. Add heavy cream and whisk to mix. Return to heat. Bring heat to medium and stir until the mixture is combined and resembles a caramel syrup. 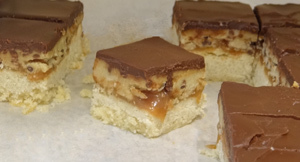 Pour caramel over the shortbread layer. Place in refrigerator for an hour to cool and firm up. If you want an easier caramel to make, try my fail-proof caramel popcorn recipe for the caramel layer. In a stand mixer, combine butter and sugar and mix until light and fluffy. Add vanilla and heavy whipping cream and mix again. Add flour and salt and mix until incorporated. Stir in mini chocolate chips. 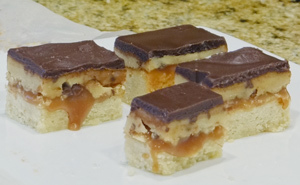 Spoon cookie dough layer over caramel layer and spread evenly. 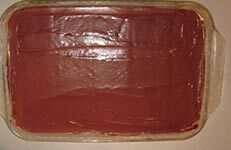 Cover and refrigerate while preparing ganache. Place chocolate chips in a medium sized bowl. In a saucepan, combine heavy whipping cream and vanilla extract and bring to a simmer. Pour mixture over chocolate chips and allow to sit for about 5 minutes. Stir until chocolate is melted and completely smooth. Pour completed ganache mixture over cookie dough layer and return to refrigerator until completely set. 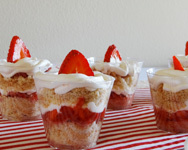 These cute strawberry shortcake parfaits are a fun dessert to serve to guests. The layers are so pretty! The shortcake layer can also be swapped out with pound cake or angel food cake to get a variation of flavor. Preheat oven to 400 degrees. To make shortcake mix Bisquick, 3 tablespoons of sugar and the melted butter in a medium sized bowl until combined. Spread mixture in a lightly greased 8x8 pan. Bake 15-20 mins. Cool Completely. Crumble shortcake. In a bowl, mix chopped strawberries with 1/4 sugar. Allow the strawberries to sit in the sugar for at least 30 mins to fully bring out the flavors. In a medium sized bowl, place the heavy whipping cream, powdered sugar and vanilla extract. Using a hand beater, mix until whipping cream forms stiff peaks. 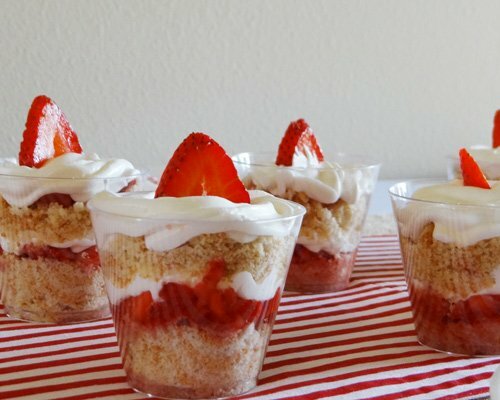 Layer the strawberry shortcake in a small clear container so the layers are visible. I used 5 oz tumblers and they were the perfect size. 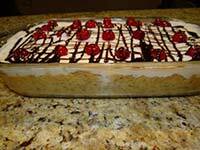 I layered 2 tablespoons of shortcake, 2 tablespoons of the strawberries and then piped a circle of the whipped topping using a large piping tip. 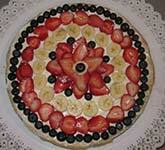 Then I repeated the layers one more time and topped with a slice of a strawberry. Preheat oven to 350 degrees. Lightly grease 9x13 pan and line with parchment paper. In a large mixing bowl, combine together cake mix, oil, eggs, sour cream and cream of coconut and mix well. 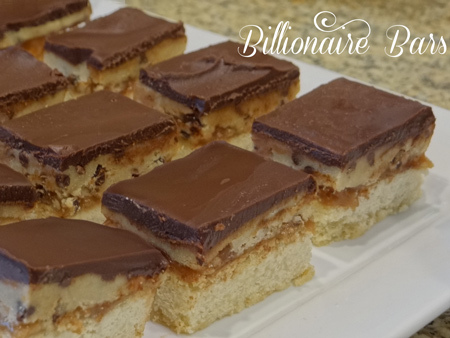 Pour batter into a 9x13 pan and bake for 40-45 minutes or until toothpick inserted in cake comes out clean. Allow cake to cool completely. To make frosting, combine softened cream cheese and butter together in a large mixing bowl. Beat together until it is light and fluffy. Add coconut extract and powdered sugar. Mix again until fully combined and frosting is light and fluffy. 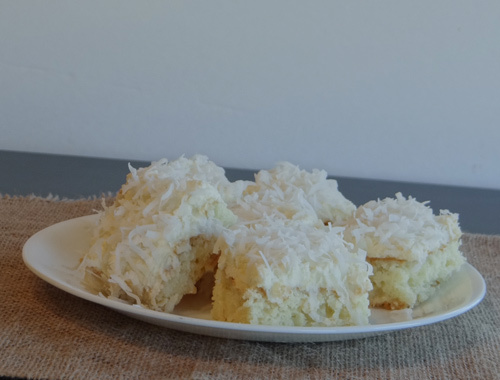 Frost cake and sprinkle coconut on top. If needed, refrigerate cake an hour or so to make it easier to slice. Enjoy! Share your favorite baby shower recipes with us!